For more fun in the Italian Alps, I’ve been hearing raves about Bella Baita B&B, a mountain retreat about an hour from Torino, in Serre Marchetto, on the French border in the Val Chisone. Guests write that their stay here was “a trip of a lifetime”. Most tell me first about the location, with its amazing views of the alps and fresh mountain air, and all the wonderful hiking, cycling and skiing around there, but then they rave even more about their hosts, Marla and Fabrizio, two profesional chefs who love guests. 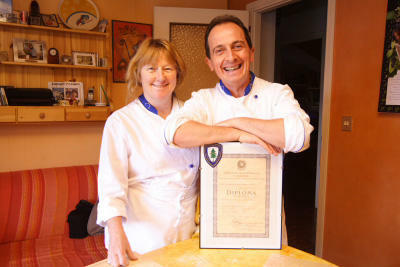 Marla is an American wizard of a pastry chef (so be prepared for amazing breads and sweets at breakfast), and her husband Fabrizio, who grew up here, is also a culinary star. Dinners, featuring the specialties of the Piedmont region, make “memories of a lifetime” according to my discerning friends. They also offer cooking classes, which begin at a local market and end up with entertaining classes in their kitchen and then of course a to-die-for meal. 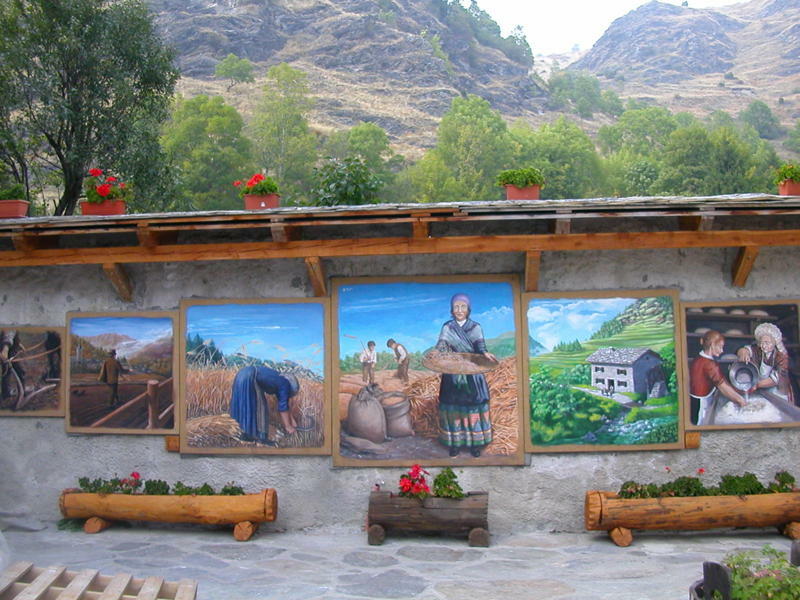 They have a great blog, where you can find wonderful recipes, and also have created an association (TEM) that supports ecologically sustainable tourism in the mountains. I’m amazed at the prices for this dream-of-a-spot: 55euro for a double room. 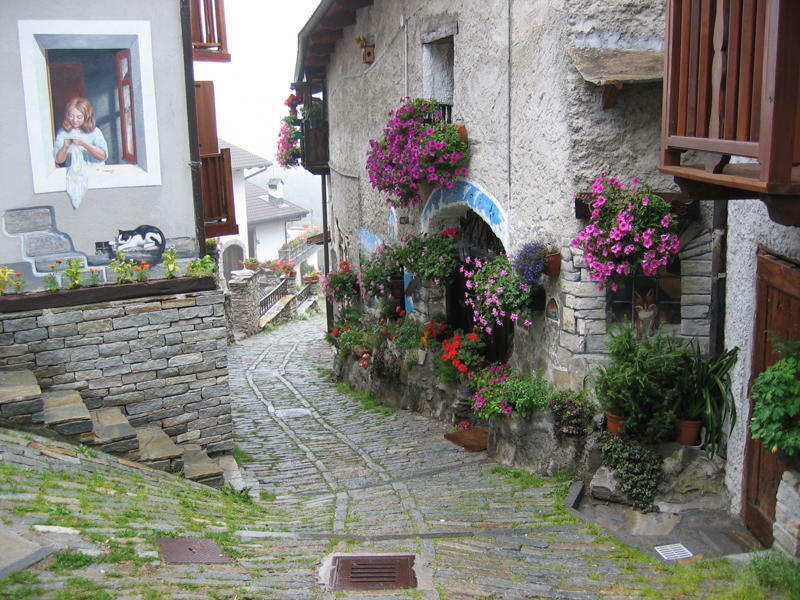 Val Chisone, my husband’s alpine homeland, is a relatively well kept secret and a gem of a discovery for those looking for an accessible entrance to the Piedmont Alps. It is a historically rich area with intertwining cultures, customs, kingdom boundaries, and spectacular physical beauty. Our valley is part of Turin’s sprawling province, being one of the natural mountain boundaries separating us from France. To discover the valley’s charms in One Golden Day, we suggest the Grand Valley Tour. Starting out from our small mountain inn, “Bella Baita”, we will feed you a delicious breakfast and send you on your way. 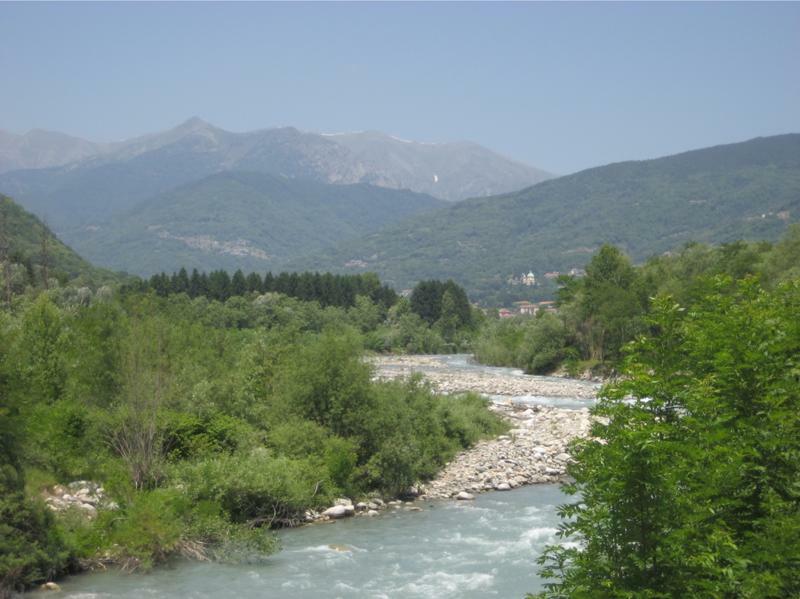 You will head down our hill and then go up the valley, following along its namesake, the Chisone river. You’ll pass through chestnut and larch forests, small mountain villages, whose buildings feature roofs made of locally quarried slabs of slate, along with abundant flowers and tidy gardens. The old tradition of mural paintings on the buildings had all but died out, but found a renewed interest about 15 years ago, so you’ll see quite the array of murals adorning many of the buildings along your route. If you look a little closer you will also see a variety of painted meridians, or vertical sundials, that are quite common throughout this part of Italy and France. 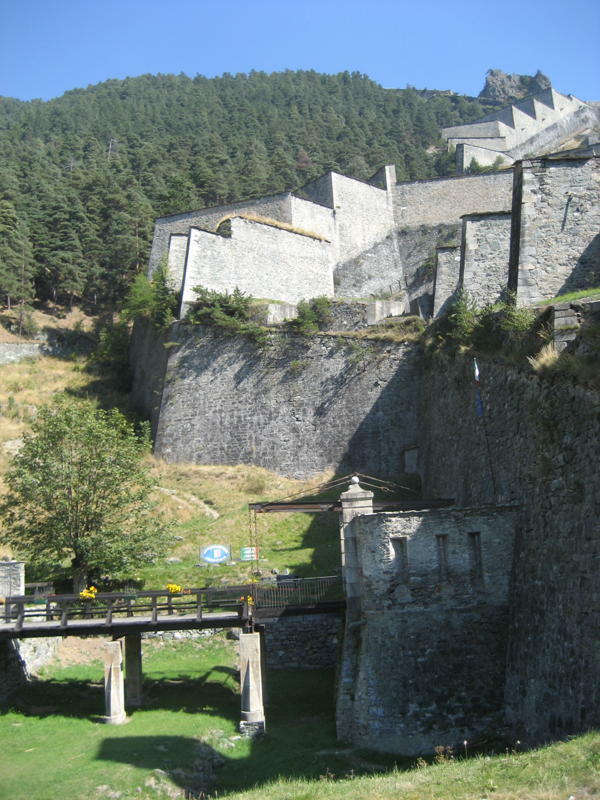 Continuing on you arrive at Fenestrelle and marvel at the largest fortress in Europe, sometimes referred to as the “Great Wall of Piedmont”. You will be amazed to discover “La fortezza di Fenestrelle”, with it’s nearly 4,000 steps, as it is tucked out of sight as you approach. It took about 125 years to build, and is impressive with its garrisons and covered stairwells. It is difficult to fully appreciate from the base area, but do take time to wander around the buildings that you can access, stopping in the information building that also has a scale model of the fortress on display. Make sure to sample a pastry and coffee in the “Cafe des Forcats“. Various tours in English can be arranged in advance with enough participants. A mere half kilometer onward, you will find tiny Usseaux, and be entranced by their colorful murals that are painted in nearly every nook and cranny. You will get a complete view of the entire Fenestrelle Fortress as you enter the village by way of the church. If you’ve worked up an appetite, you will find “Trattoria La Placette”, a welcoming place with tasty traditional dishes on offer. It is located right next to the church. The family serves up northern mountain house specialties like polenta and wild game stew, filled pasta and gnocchi served in a cheese sauce made from Plaisentif cheese produced by the neighbors and their cows. If you have plenty of day left, continue on up the road past the “2006 Winter Olympic” ski jump and cross country sites, before arriving in Sestriere, perched at the top of our Chisone and the parallel Susa valley. Sestriere hosted several Olympic ski races and Olympic village in addition to the annual World Cup ski races. 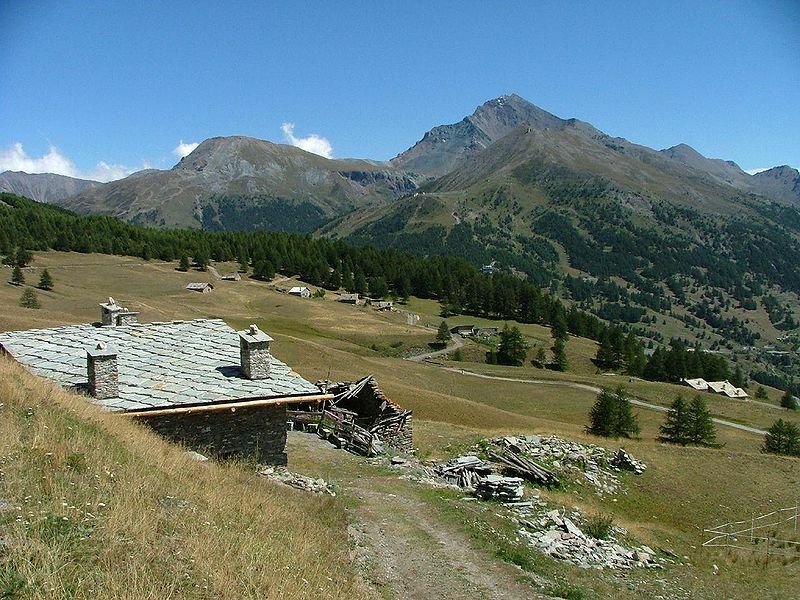 It has a spectacular view of both valleys, which lead back to Turin and on to France. If you didn’t have lunch earlier, or maybe you are feeling peckish, head over to L’Enoteca dell’Orologio (Residenza Torre dell”Orologio 1/A10058, Seastriere, 338 7425011). This modest small cafe is open even when everything else is closed for the afternoon break. Costantino makes and serves up Gofrie, to order, hot off the waffle iron. This local specialty is usually only found during festivals and can be savory with many tempting fillings or sweet with the perennial favorite, Nutella. Linger with a glass of local wine from a fairly impressive wine selection before heading back to Bella Baita, where the mountain air will insure that you will savor your night’s sleep as much as your days outing. This is the stuff that memories are made of to cherish and savor again and again. Grazie for this Golden Day, Marla! I had a recent opportunity to stay at Bella Biata with friends. The ambiance is casual, the views wonderful, the rooms private and comfortable. 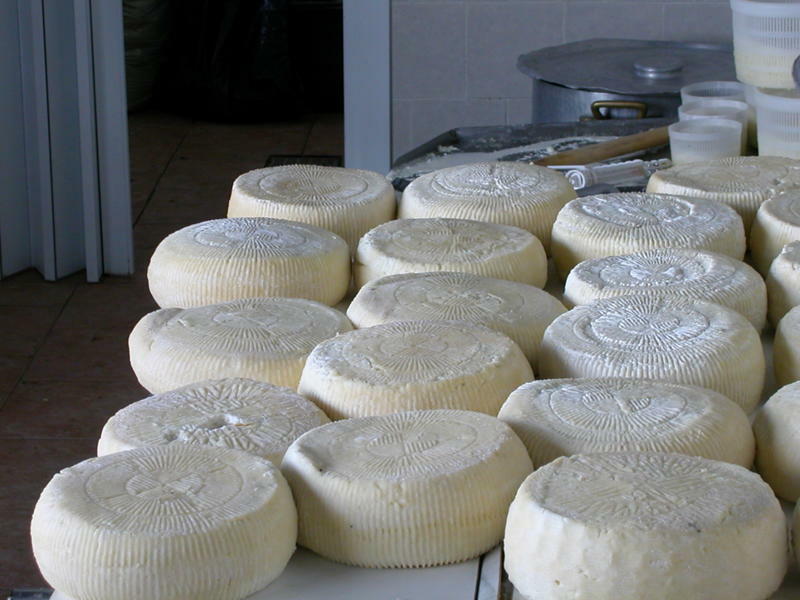 The food is fresh, locally produced, and prepared with obvious love. We had brought wine from France but were happy to leave it unopened in favor of the local wines recommended by Fabrizio and Marla. Thanks Mark, you probably could have done some wine trading with us. Ha ha! It was great to meet the three of you! My husband & I are two of our best friends just stayed at Bella Baita for one night and it was a wonderful experience! It is a destination to aim for and to plan on staying for more than only one night – experience the region with the help of Marla & Fabrizio and take a cooking class! Thanks Cindy, we enjoyed your visit as well. We hope one day you will be able to find your way to our doorstep and stay too, Jann.